I hope you're all getting in some fun travels this summer! Or exploring your neck of the woods with a staycation! 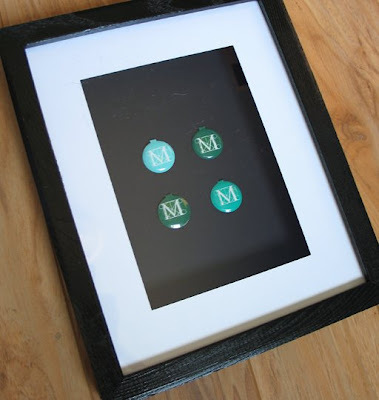 I wanted to show you a fun, easy way to display any keepsakes you might pick up on your outings. 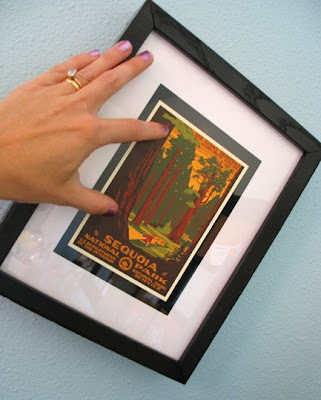 I nabbed this little shadow box at a youth garage sale last summer ... but you can find these everywhere - save those Michael's coupons! :-) It was new with an unfinished wood frame. 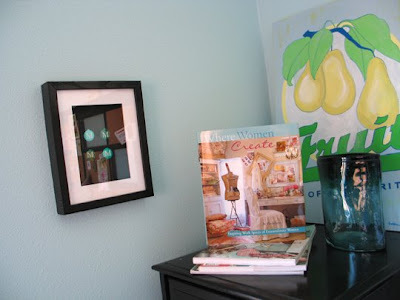 I sprayed it black last fall during my studio makeover frenzy, but then it sat until recently. I finally got back to it and decided to pop in a few entrance pins from The Met. The Metropolitan Museum of Art in NYC was one of my favorite places to visit when I lived out east: I added a piece of black tag board in which I cut 4 slits. I slipped these little pinch-on badges through the slits and didn't have to glue anything! Here it hangs in my studio: While I was putting up the shadow box, I thought of a lot of other things I could put in there. 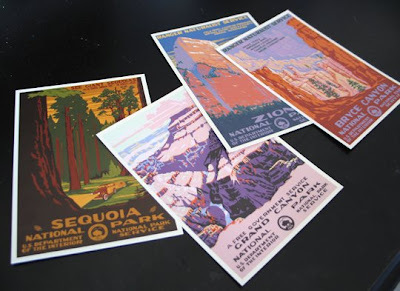 Like these retro postcards from our National Parks: Incidentally, these are all spectacular places to visit, so if you're still thinking about summer travels, I highly recommend!! (And, geek alert, I'm excited to see the new documentary coming out on PBS in September featuring our National Parks!) 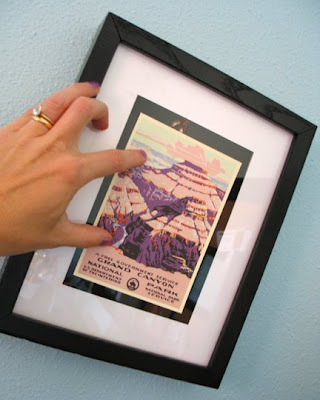 Anyway, here's how they might look: An inexpensive postcard from your travels would become a special treasure simply by displaying it in a deep-set frame. Enjoy your summer outings and share in the comments YOUR ideas - what inexpensive keepsakes do you like to keep from your travels: sea shells? ticket stubs? brochures? menus? this is my 100th post!!!! So check back, I think my next post will be a giveaway to celebrate!! Over from SITS to say hi! What a great idea... A friend of mine used a shadow box and put stuff from my daughters wedding in it and gave it to her as a wedding present. It turned out so beautiful. Thanks for coming over to my blog. 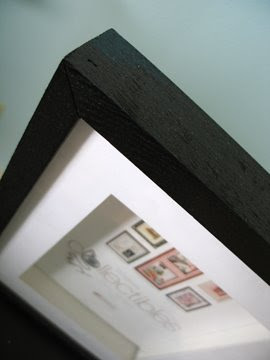 I love what you have done with the frames.Great job. I collect squished pennies from my trips. They're a great reminder of where you're been, and usually they only cost .50 plus the penny! Nice stuffs!! Thanks for sharing.